Strange Brew is a Hampshire based four piece playing a mix of rock-edged blues and soul classics with a few pop classics thrown in for good measure. 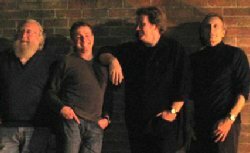 The band has been together for around nine years playing at venues all around the south east. Gigs include; corporate events, parties, beer and music festivals and clubs. We cover a range of audiences from the younger pub goers to the hard nosed beer festival crowd and old blues musos. Our set list includes over 80 songs from Stevie Ray Vaughan to the Eagles - BB King to the Beatles. All four members of the band deliver vocals so our range of styles is pretty diverse - we've been asked to learn a few strange numbers for a few special events... If we can deliver it - we will!